Young people and minorities are traditionally among the least reliable voters, particularly in midterm elections. The electorate in Florida this year is especially unpredictable due to an unusual collision of events. DeSantis has benefited from Trump’s occasional backing on social media, including after the debate. And Gillum is scheduled to campaign this week alongside former Vice President Joe Biden and 2016 presidential nominee Hillary Clinton. In the interview, he noted he’s been in touch with former President Barack Obama, who may campaign on his behalf. The state’s other trauma — a school shooting earlier this year that left 17 students and staff dead at Marjory Stoneman Douglas High School in Parkland — looms over the races. Backed by the fortune of Democratic billionaires Tom Steyer and Michael Bloomberg, Florida’s young people are fighting to be heard. “If he is successful and other candidates are successful, it will mean that my fellow classmates didn’t die in vain,” Kaufman said. African-American leaders are also working to reverse their community’s typical drop-off in midterm elections. NAACP President Derrick Johnson said his organization is “microfocused” on boosting black turnout this fall. A statewide canvassing effort is underway across Florida, where organizers hope to bump black turnout by at least 5 percent from four years ago. It was easy to find evidence of Gillum’s influence among so-called low-propensity voters in recent days, as activists from more than a half dozen competing groups scoured the state to ensure they cast ballots. Anne Fazio, a 19-year-old Jacksonville student, was among thousands of people contacted at home over the weekend by the Koch-backed Americans For Prosperity’s massive door-knocking push. Standing at her front door, she didn’t hesitate when a conservative volunteer asked whether she was going to vote. “I’m voting for Andrew Gillum,” Fazio said, praising his support for gun control and expanding Medicaid coverage for hundreds of thousands of low-income residents. 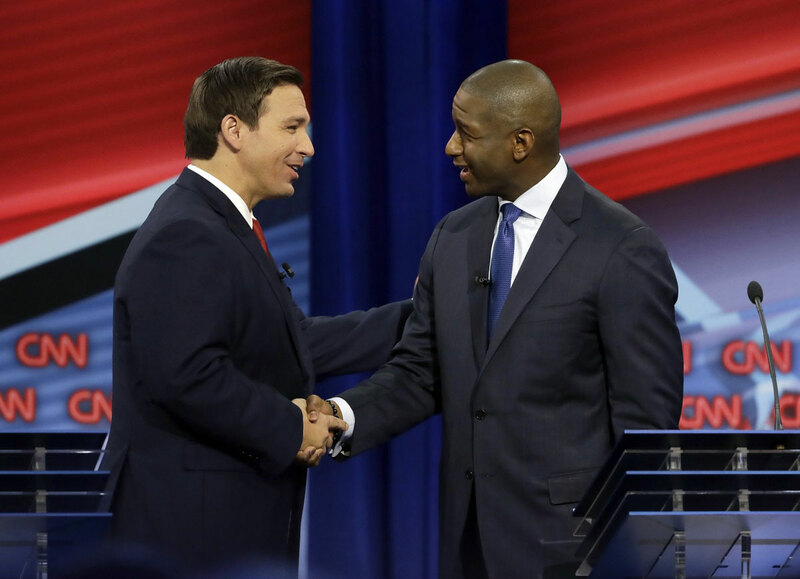 DeSantis vowed during Sunday’s debate to work closely with the Trump administration, while noting that Gillum has called for Trump’s impeachment. “You’ve got to be able to work with the administration,” DeSantis declared. He also dismissed Parkland students’ calls for stronger efforts to reduce gun violence when asked about his opposition to modest gun control measures passed by Florida’s Republican-led legislature in the wake of the Parkland shooting. DeSantis said local law enforcement and school officials “let them down” by not acting sooner to detain the shooter and address his mental health issues sooner. Since the beginning of September alone, each side has dumped more than $44 million into television advertising for the governor’s race. While that may be the most in the country, it’s a fraction of the spending in Florida’s Senate contest, according to political operatives tracking media spending. Paced by the Scott campaign’s $50 million, the Republican side has invested nearly $79 million in television spending since April compared to Democrats’ $49 million behind Nelson. “He scares me, I’m sorry,” 75-year-old retiree Suzanne Zimmerman, a member of Villagers for Trump, said of Gillum.